It is my pleasure to introduce Little Spruce Organics to those readers who may not be familiar with this online retailer. I truly admire what Bethany has put together, and her efforts have made for an extremely unique store. She has provided me with nothing but exceptional customer service for all of my purchases, including once taking extensive measurements of several different pieces of clothing to help me decide which size to buy. Little Spruce Organics has products for both mothers and children. Everything they carry is made of natural materials/fibers, and all of the textiles are organic. They specialize in wool apparel, and have a fantastic selection for children of all ages. The Sichuan Alkena Silk is from a biodynamic silk farm in China, and you can read all about their practices and organic certification here. She has clearly gone to great lengths to stock only the most responsibly made, quality products for her store. One of the purchases I made and have come to love are the Disana Leggings pictured here. They are cozy and stretchy, come in a fantastic selection of colors, and the cuffable style enables them to be used for at least two winters. What I like best about them is if you cloth diaper with wool, these fit amply over even the thickest of wool covers/soakers. I never bothered lanolizing them, but I used them over the same covers I use in the summer. That meant I needed fewer longies to get us through the winter, and since I find soakers easier to lanolize, it saved me some time as well. The only minor downside is these do tend to pill more than any other wool I own, which is why we ended up using them more for nights and around the house. Recently we purchased this wooden sailboat by Glueckskaefer, and could not be happier with it. As with most German toys, the quality is impeccable, and I foresee this being passed down and lasting a very long time. 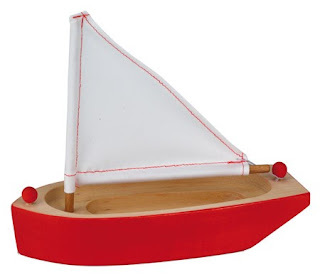 It sails perfectly upright, and my daughter really enjoys it in the bath. I encourage you to peruse everything Little Spruce Organics has to offer. Their selection is truly unique, and everything is of exceptional quality and responsibly made. If you register for an account you can receive 20% off your first purchase, and if you sign up for their newsletter or watch their facebook page, there are often discounts to be had nearly every month. Love little Spruce. It's so hard not to buy everything when I go to their site!